The Authentic Foods Lemon Cake Mix is all natural, GMO-free and perfect for any dessert occassion. The cake comes out moist, bright, tangy and never gritty. Simply add eggs, milk (or a non-dairy substitute), and oil, then bake and enjoy. Adding a lemon buttercream frosting and a lemon custard filling will add an extra special touch for your diners. This mix makes a 1 layer cake. 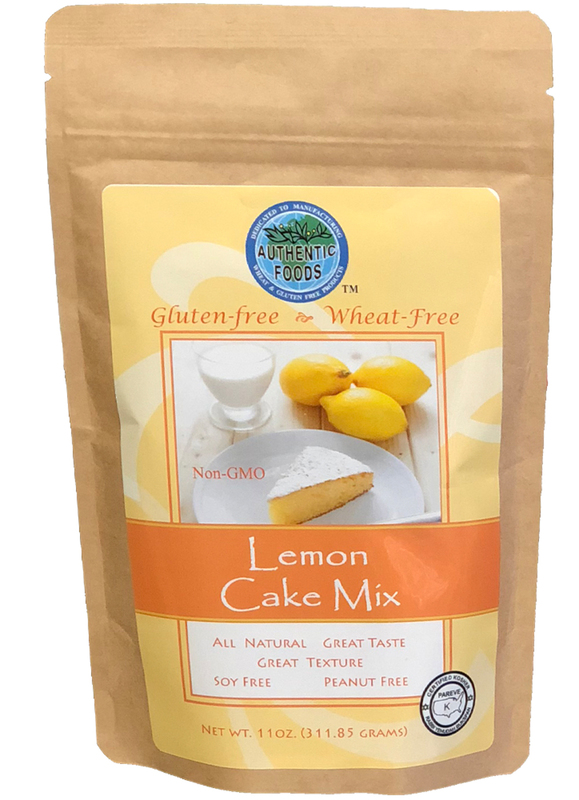 Ingredients: Granulated Cane Juice, Rice Flour, Potato, Lemon Juice, Tapioca Flour, Fiber Blend, Calcium Acid Pyrophosphate , Tricalcium phosphate, Natural Non-Dairy Flavors (Gluten Free), Sodium Bicarbonate, Salt, Citric Acid. Preheat oven to 375 degrees Fahrenheit. Lightly grease the bottom and sides of a 8” cake pan.